1.1 Post-2011 constitutional negotiations: Since 2011, the debates that took place over the role of Islam in Arab constitutions have frequently been controversial. This paper should investigate the different methods that were used in the constitution-drafting processes. What are the constitutional options available to Muslim-majority countries in successfully negotiating this issue? 1.2 Secularism, Islam and constitutional law: This paper should survey whether constitutions in Muslim-majority countries currently feature or should feature counter-majoritarian safeguards designed to counteract the potential for theocratic encroachment. It should also examine what the purpose of such safeguards should be, and in particular whether they can serve the purpose of transitioning towards state secularism within these countries’ constitutions or separating religion and politics. The paper should also discuss how the relationship between religion and state is worded in comparative practice, particularly to protect state institutions and citizens’ rights from encroachment by religion. 1.3 Islam, democracy and human rights: Most muslim-majority states officially recognise Islam as the state religion and also enshrine liberal democratic principles within their constitutions, even as the larger debate over their compatibility continues. This paper should assess a) the empirical relation between Islamist governance and human rights and/or b) interpretive approaches that have been invoked at times by various state actors in order to reconcile the two. 2.1 Islamic lawmaking: Many Islamic constitutions include a clause establishing “shari’a” or “principles of shari’a” as a/the primary source of legislation. This paper should discuss how legislatures and other lawmaking bodies have interpreted this mandate and how they have translated shari’a and the various schools of shari’a thought (madhahib) into unified, civic codes of law. 2.2 Judicial review: Just as it is empowered to review legislation generally for constitutional compliance, the judicial branch is tasked with holding the legislature accountable to shari’a supremacy clauses. In several states, however, the executive reserves the right to restrain or override this power. This paper should explore the methodology, independence, and activism of the judiciary in its exercise of this privilege along with the complementary checks wielded by the political branches. If appropriate, it might compare Islamic judicial review to more conventional forms of constitutional review or comment upon its impact on society. 2.3 The role of religious institutions: Some scholars have argued that Islamic jurists (ulama’) comprise a “fourth branch” of government in states founded upon Islamic principles. Depending on the state, clerics have alternately been granted sweeping executive authority, limited autonomy over certain religious matters adjudicated in specialized courts, or merely an advisory role to lay judges and lawmakers. In what circumstances is it appropriate to either reserve legal issues to the exclusive jurisdiction of the ulama’ or to seek their input? 3.1 Religious freedom: This paper should discuss whether full religious freedom and equality is possible under Islamic rule, focusing on the condition of religious minorities and/or secularists. It should confront issues such as communitarian notions of citizenship, vestiges of the Ottoman millet system, blasphemy and apostasy laws, equality before the law, and conflict of religious law. 3.2 Women’s rights: This paper should examine the current status of and prospects for women’s rights under Islamic-influenced constitutional systems, engaging in debates surrounding areas such as family and inheritance law, modesty requirements, and political inclusion. It might also explore the avenues Muslim women have taken to advocate for their rights. If you are interested in carrying out any of the above studies, please send an abstract to conferences@dustour.org no later than 17:00 Tunis time on 18 November 2016. Abstracts should be no longer than 500 words, which includes the research methodology and the main research question that will be addressed in the study. Applicants should also send their CVs, including a list of publications, with their abstracts. Abstracts may be submitted by individuals, co-authors or institutions. Membership in the Arab Association of Constitutional Law is not a requirement. Abstracts and papers are strongly encouraged to adopt a comparative approach. Abstracts and papers that focus on individual countries will still be considered. Individuals from outside the Arab region who wish to submit an abstract that focuses on developments that are taking place outside the Arab region are encouraged to do so, while ensuring that all discussions are aimed towards furthering and enriching the discussion in the Arab region on the topics set out above. Abstracts may be submitted in Arabic or English. The individuals who will be selected to carry out the above studies will be required to prepare oral presentations summarizing their findings at the conference. There are plenty of CfPs for this year’s upcoming MESA conference in Washinton, DC, 22-25 Nov. Included among the CfPs are three current McGillians and one recent graduate. For further information take a look at MESA Member Calls for Participation. Hope to see you in Washington in November! The concept of paradigm opens broad possibilities for the analysis of social and intellectual phenomena across diverse traditions and time periods. Paradigm is commonly but not exclusively viewed as a system of knowledge with a particular power structure, within which a set of beliefs or values plays a dominant and defining role. Studying paradigms may consist of analyzing major social transformations to reveal the paradigmatic tensions and crises underlying them, or employing paradigms as tools to clarify socio-political events. Furthermore, the very notion of paradigm can be contested and transformed. The annual Graduate Student Conference at Columbia University’s Department of Middle Eastern, South Asian, and African Studies (MESAAS) is soliciting papers exploring the debates, moments, and spaces in which paradigms undergo crisis and conflict, or challenge the dominant theoretical positions underpinning its very constitution. Papers can focus on any topic within the humanities and social sciences. – Paradigm as Comparative Tool: How do paradigmatic elements within intellectual traditions allow for historical and cross-cultural comparative work? – Conflict In and Across Paradigms: How is conflict dealt with in a paradigm? – Paradigm Shifts: When and how do paradigms become outdated? – Critical Theory as Anti-Paradigmatic: How can critical theory challenge established paradigms or paradigm shifts? – Paradigmatic Technology: How does the adoption of a given technology challenge, strengthen, or influence the implementation or development of different paradigms? Students interested in presenting a 20-minute paper should submit a 300-word abstract and one-page CV to the website by January 15th. Panel submissions are encouraged. Exceptional papers will be collected into a digital volume under the conference title. We are pleased to invite students and faculty to submit papers for the 28th Annual *Middle East History and Theory (MEHAT) Conference, to be held May 3­-5, 2013, at the University of Chicago. We welcome a broad range of submissions from across the disciplines, including (but not limited to) anthropology, art history, cinema and media studies, economics, history, literature, philosophy, politics, religion, sociology, or any other topic concerning the Middle East from the advent of Islam to the present day. 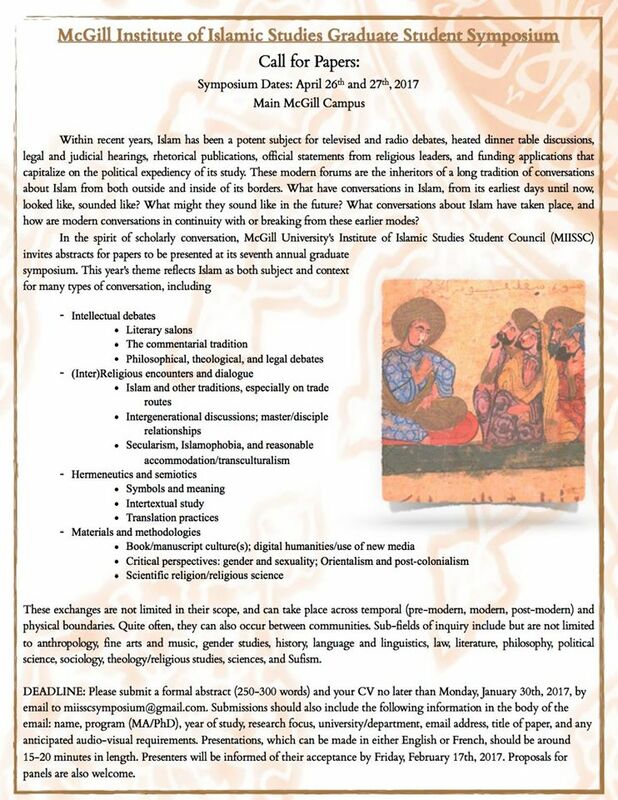 Those wishing to participate should send a 250-word abstract to the conference organizers at mehat.chicago@gmail.com by February 15, 2013. We will accept both individual papers and prearranged themed panels; the latter is especially encouraged. More information about the conference and submission process can be viewed on the Conference page: http://cas.uchicago.edu/workshops/mehat/conference/. The Middle East Center at the University of Pennsylvania is putting out a call for papers on cultural, social, political, economic, and intellectual exchanges between the Ottoman and Persian empires 16th through 20th centuries for a day-long symposium to be held in Friday, 26 April 2013 to be held at the University of Pennsylvania. Championing different expressions of Islam and sharing a long and turbulent border, the Ottoman and Persian empires rivaled each other since the rise of the Safavid state in Persia in the 16th century until the fall of Qajars and the Ottoman dynasties at the turn of the 20th century. This regular contact produced rich historical encounters between the two states. Traditional historiography had portrayed the Ottoman and Persian histories as a narrative of struggle against European encroachment and attempts at “modernization” that derived inspiration from Europe since the early 19th century. Until recently, such a portrayal had overlooked the rich historical interactions between the two empires, including but not limited to trade, smuggling, pilgrimage (or religious tourism), intellectual exchanges, nomadic border tribes, and expatriate communities that inhabited the Ottoman-Iranian territories. The symposium hopes to bring together scholars working on issues at the intersection of Ottoman and Persian relations to shift the focus of the debate to the eastern fault line of Middle Eastern history and to shed light on the historical interactions between the two empires, which governed almost the entire Middle East up until the end of World War I. Please submit your abstracts (300 words maximum) by 1 November 2012 . 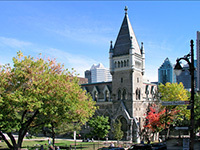 Selected scholars will be contacted in December 2012, and Penn’s Middle East Center will publish the papers presented in the symposium as an edited volume. Since the 1980s, neoliberalism has expanded enormously as ideology and practice, continuously transforming institutions, discourses, and people across borders. As free market processes accelerated, neoliberals sang the praises of liberalized trade and markets, austerity measures, and the reduction of social welfare. Yet, rising income disparities and worldwide uprisings against neoliberal practices, from the Middle East to Europe and the States, all pose a profound empirical challenge to the invincibility and effectiveness of neoliberalism. The political awakening and emergent discourses of dissent in the Arab Spring effectively demonstrate the intersections between repressive governance and economic discontent in the neoliberal Middle East, for instance. Neoliberalism thus penetrates the social and the political in unique ways as various actors redefine public spaces, galvanize new subjectivities, and grassroots mobilization against inequity. As well, neoliberalism encompasses the transformation of power relations as it fosters new forms of governmentality and public management, both challenging and buttressing Weberian bureaucratic structures. These new and shifting forms of neoliberal governmentality have also affected the place and practice of religion, challenging ethnographers to question both the relevance and the contours of separate realms such as “economy” and “religion” across private and public domains. the discursive, performative, and material practices that thrive in the overlap between these meta-discourses and shifting subject positions in tangible geographies. 250-word submissions with contact information and a brief bio to be sent to both: Damla Isik (disik@regis.edu) and Öykü Potuoglu-Cook (oykupotuoglucook2008@u.northwestern.edu) by 30 March 2012 the latest. Those who are included in the panel must become AAA members (or renew their memberships) and register for the conference prior to 15 April 2012 which is the deadline for panel submissions. For over twenty years Islam and Christian-Muslim Relations has been one of the leading peer-reviewed academic journals providing a forum for the academic exploration and discussion of the religious tradition of Islam, and relations between Islam and other religions. The journal seeks to provide a very timely turn-around time on articles submitted. The editorial team is currently considering articles for publication in its special thematic issue titled “Reflections on the Arab Spring” to appear in October 2012. The journal is edited by members of the Department of Theology and Religion of Birmingham University (Birmingham, United Kingdom) and the Centre for Islam and the Modern World of Monash University (Melbourne, Australia). Articles should be sent to editor Professor Greg Barton (greg.barton@monash.edu), associate editor Dr Irfan Ahmad (irfan.ahmad@monash.edu) with copy to editorial assistant Virginie Andre (virginie.andre@monash.edu), in the form of e-mail attachments in simple Word format. For purposes of anonymity through the refereeing stages, the title alone should appear at the beginning, and references elsewhere that might lead to easy identification of the author should be omitted. All articles should be prefaced by an abstract of 150-200 words. The author’s postal and e-mail addresses, together with brief biographical details of about 50 words, should appear on a separate page. All pages should be numbered. Articles should be approximately 10,000 words in length (articles shorter than 9,000 words and longer than 12,000 words will not be considered), including references, appendices, tables and figures. Footnotes to the text should be avoided wherever possible. Articles which the editors judge to have merit will be sent anonymously to two referees, and authors may be asked for changes and adjustments in the light of the referees’ reports. Further instructions for authors regarding style guidelines, referencing and templates are available at: http://www.tandf.co.uk/journals/journal.asp?issn=0959-6410&linktype=44. Papers should be submitted by 24 April 2012. Call for contributions: Revolts and transitions in the Arab world: towards a new urban agenda? This international colloquium, organised by the CEDEJ at the French Institute of Egypt (Cairo) on november 7,8,9 2012, aims to discuss the urban dimension of the great changes in the Arab world, from the origins of the 2011 revolutionary episodes to the present experiences of democratisation, along with phases of political transition and socio-economic crisis in which states are still entangled. Deadline for submission: May 15, 2012.